24 Hour Service. Call Now! We are your home comfort experts! Keep your family happy with better indoor air quality! Your family is happiest when they are comfortable and healthy! 7-Star Service Company offers reasonable air conditioner repair. We install and repair air ducts with our complete HVAC services. 7-Star Service Company offers affordable and reliable air conditioning repair, maintenance, and installation. Our team of professionals are experts in everything related to heating and cooling systems as well as ductwork funneling throughout the walls of your Pflugerville home. Each HVAC contractor can service nearly any make and model of air conditioners or heaters in an efficient and timely manner while helping your stay on budget. We are fully committed to providing quality air conditioning or heater repairs, replacements, installations, or routine maintenance checks at a competitive, affordable rate. Whether you are in the market for a new system installation or a few minor repairs, let one of our HVAC contractors help you. You might think you can repair your AC unit yourself however, it is better in the long-haul of things to have a professional come out and service it for you. For residential cooling and heating services, trust 7-Star Service Company. 7-Star Service Company serves Pflugerville and surrounding communities 24/7. A proper working air conditioning unit is a MUST for anyone living in Texas! It always seems that on the hottest day of the year, your AC unit decides to quit on you. 7-Star Service Company is available 24 hours a day, 7 days a week for all AC unit repairs. It’s not too often that we need to run our heaters in Texas, however, on the night that you need to have it running, you’ll want to make sure it works! If you start to notice your heater is not heating all rooms of your home, let us help you. Are you noticing hot or cold sports throughout your home? Does the air conditioner run longer than it should? If you are experiencing any of these problems, perhaps it’s time to get your air ducts repaired! Do you know how clean your indoor air quality is? Did you know that your home’s indoor air quality can actually be worse than the outdoor air quality? Perhaps it’s time to have an indoor air quality test run to see where improvements can be made. 7-Star Service Company values each customer which is why we have centered our business model around our customers. We take the time to get to know each customer so we can better help them maintain not only their home’s health but also their families. Our team of expert HVAC contractors are available 24/7 for all your heating and cooling needs. We have over 15 years of experience and are ready to help you start saving energy with a new HVAC system! Call us or use our online scheduling to set up an appointment and see how you can start saving money today! I've worked with Lawrence 2 times now. Every time I've had a positive experience. Nice guy, always on time (or early!) and charges you what he says it'll be. 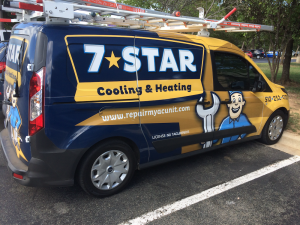 After getting the run around from several other AC contractors, we called 7-Star. Lawrence was professional, friendly, and prompt. He walked us through all of our options, and helped us to select a solution that was right for us. We won't go to anyone else for our heating and cooling service or repairs! This is something apparently rare in this area; a company that answers, returns calls, makes appointments and keeps them. Lawrence did all these He was personable, but down to business and gave me some tips on extending the life of the units So, if you need someone to help you out give him a call.